Kalakaua is one block to the beach. This is an immaculate one bedroom that sleeps four comfortably. This air-conditioned executive suite has lots of upgrades and additions. The unit is equipped with a Pentium IV computer that allows high speed internet access and wireless signal for your personal laptop. It has a Deluxe King bed in the bedroom and a very comfortable $1,300 sleeper couch bed with lots of extra linens. There is also a single futon with linens. This suite has been stocked with X Box & games and a movie video library. It boasts a full kitchen with brand new refrigerator, stove/oven, pots, pans, rice cooker, dishes and silverware, deluxe Sharper Image T-Fal toaster, heavy duty blender, 2 color TVs, 2 stereos(CD & Tape), 2 VCRs, 2 DVD Players, $400 Sanyo microwave/Browner, tea pot, coffee maker and grinder, 2 remote phones, smoke alarms, iron and ironing board, lots of towels, large vacuum w/hand vacuum and alarm clock radio/CD player in the bedroom. The unit is on the second floor and easily accessible by stairs or elevator....just 5 steps from the elevator and parking. Secure covered parking is included at no extra cost. There are fireworks one block away at the Hilton Hawaiian Beach Resort and Spa every Friday night between 7:30 pm and 8:30 pm. Subway Deli, ABC Store, 7Eleven and Cheeseburgers in Paradise are next door. 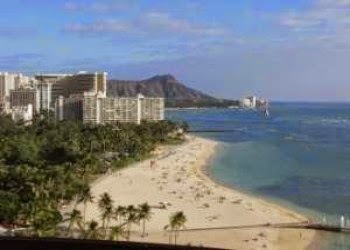 You will enjoy visiting because of your proximity to the beach, (Hilton Hawaiiian Village Beach Resort and Spa) and ocean activities, shopping (Ala Moana Shopping Center), grocery store (The Food Pantry), night life, restaurants and of course the new Hawaii Convention Center. Nearby activities: Golf, Tennis, Fishing, Wildlife Viewing, Shopping, Restaurants, Live Theater, Cinemas, Museums, Sightseeing, Swimming, Snorkeling & Diving, Boating, Sailing, Surfing, Windsurfing, Parasailing, Jet Skiing, Shelling. The unit is one block to the beach and (Waikiki) is just 25 minutes from the airport.